At least, I think this is it for homemade gifts. It is a long-sleeved t-shirt for DH. 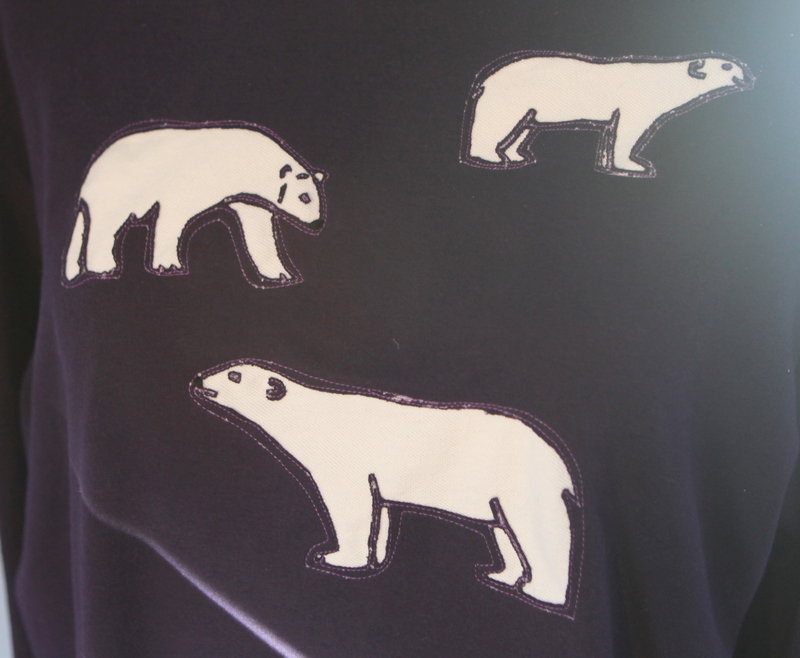 It has polar bears reverse-appliqued on the front. I made it with some purple knit from fabric.com. He likes purple. And polar bears. Here’s a detail shot of the reverse applique. My technique is to draw the motif on tissue paper, then place the tissue on the layers of fabric and stitch over it. This tends to leave lots of tiny bits of tissue in the stitching, which are a pain to remove. It dawned on me, as I was picking them out with tweezers, that it would be much easier to place the tissue on the wrong side of the fabric and stitch from the wrong side. I will do that next time. I hand-embroidered the black noses on. I must go now and fret over what else needs to get done. This entry was written by Claudine, posted on December 21, 2010 at 2:04 pm, filed under applique, Hand embroidery, mixing fabrics, sewing. Bookmark the permalink. Follow any comments here with the RSS feed for this post. Post a comment or leave a trackback: Trackback URL. Home made Christmas presents are the best. I like your reverse applique. The shirt looks really warm and cosy. I love the layout of the polar bears, Claudine. Very inventive, as it keeps the eye moving over the shirt rather than having a single bear targeted in the center. I wonder if tracing the design on tearaway or water soluble stabilizers used by machine embroiderers would eliminate the need for picking out millions of tiny bits of paper. 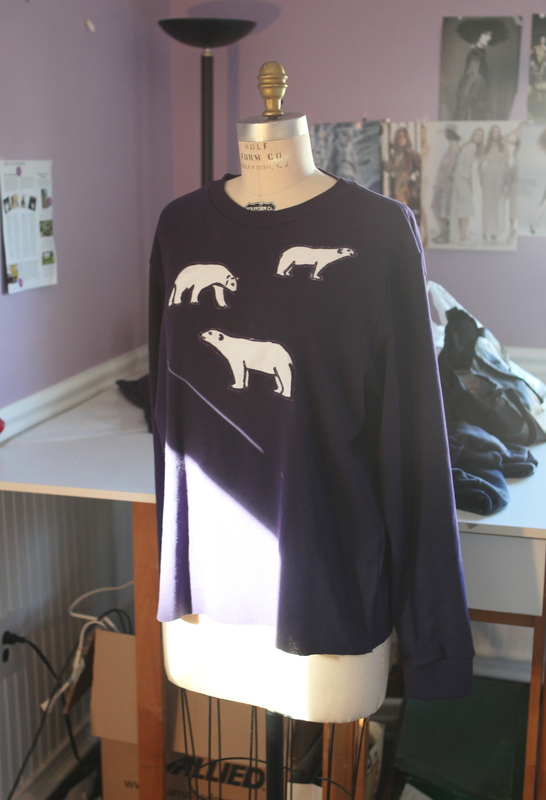 A wonderful polar bear shirt, Claudine! You are very clever.